And, if like me you can't read Spanish, here's a link to a translated version in English. It's not perfect, but the key messages come across. Always great to hear about how people use Firewall Builder and what they like about it! The team at NetCitadel is happy to share that today we released our latest version called Firewall Builder 5. This release includes several enhancements to the GUI and adds a number of new features designed to make it easier for users with large data files to manage their objects. Thanks to everyone that helped beta test Firewall Builder 5. You can find more information about this release in the release notes. An article I wrote for the May 2011 issue of the Linux Journal is now available in the free online LJ content. The article gives detailed step-by-step instructions for implementing High Availability (HA) Linux firewall pairs using iptables, keepalived, conntrackd and of course Firewall Builder. If your Firewall Builder configuration includes lots of objects then you will probably like user defined subfolders. This feature was added in v5, which is currently in beta, and lets users create subfolders below any of the standard predefined system folders. After the subfolder has been created you can drag-and-drop objects from the system folder into the subfolder. These subfolders make it convenient to organize objects by region, location, function or whatever grouping makes sense in your environment. 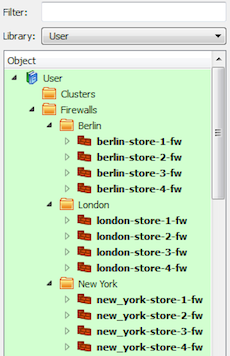 The image below shows an example of using subfolders in the Firewalls system folder to organize firewalls by the city that they are located in. More information about creating and managing subfolders can be found on the preliminary documentation here. Jack Wallen's latest article about configuring firewall settings in Firewall Builder is up on Linux.com. We look forward to seeing more articles by Jack about Firewall Builder! Jack Wallen's latest article on Linux.com is about how to manage rules on Firewall Builder. He covers both the basics and some advanced features like rule groups and rule colors that help users organize their rules. Check out our latest article on HowtoForge that walks through the steps of importing an iptables configuration using the newly enhanced import feature in V4.2. Check out the latest Firewall Builder Video Quick Tip. This one covers how to use object and service groups to simplify your firewall rules. In this week's Linux.com article Jack Wallen gets into the details about Firewall Builder object types and how to create advanced options like group objects and address tables. Another great article by Jack Wallen on Linux.com about using Firewall Builder to configure Linux iptables firewalls. Why didn't Sony use firewalls? There has been a lot of press lately about the Sony Play Station Network breach. One of the facts that came out is that apparently Sony was not using network firewalls to protect the servers that PSN runs on. This got me thinking about why a large company might not have network and/or server firewalls in place. Of course there is the capital cost of purchasing firewall hardware, but I think a far bigger factor is the ongoing operations cost of managing the firewall(s). This operations cost is one reason that we hear from customers about why they don't implement firewalls for some functions. Keeping firewall configurations up-to-date can be challenging, especially if you are managing host-based firewalls for large server farms where the number of servers is large and the pain of updating the rules is high. Our mission at NetCitadel is to simplify firewall management so that companies don't have to choose whether or not to implement a firewall. Since Firewall Builder supports multiple firewall platforms including Linux iptables firewalls, companies can install a very capable firewall using standard PC hardware, often with hardware that costs less than $1,000. Why do you think a large company might not install firewalls to protect critical resources? Most people who manage firewalls have locked themselves out of the firewall after pushing new rules at least once. I'll be the first to admit that it has happened to me on more than one occasion. Firewall Builder includes a neat feature where you can define an IP address or IP network that should always have SSH access to the firewall. This gets installed as a rule above the rest of the regular user defined rules to ensure that you don't lose access after pushing changes to the firewall. This short video shows you how to configure which address or network should always have access to the firewall. Have you ever wanted to check in real-time what commands will be generated by Firewall Builder when you compile a rule? This short video shows how easy it is to use the rule compile feature to display the specific commands that Firewall Builder will generate. Have other features you'd like to see demonstrated in a short video? Just leave us a comment about the feature you'd like to see. We will be hosting a tutorial webinar next Thursday (May 5) at 8:30am PDT / 11:30am EDT. Import of Cisco ASA/PIX/FWSM configurations. It's now easier than ever to get started using Firewall Builder to manage your Cisco firewalls. De-duplication of objects during import. Firewall Builder checks to see if the objects you are importing match objects that are already in the database. This works for importing of all supported platforms. Configuration generation for the latest Cisco ASA software versions (Cisco ASA v8.4). Advanced system configuration, including bridge interfaces and static routing, for BSD-based firewalls. You can find the full release notes on our website. Jack Wallen has a great post that is a mini how-to for Firewall Builder over on linux.com. The May 2011 issue of the Linux Journal magazine, which is now available in print edition, includes an article I wrote about how to use Firewall Builder to configure a High Availability pair of Linux iptables firewalls. The article includes step-by-step instructions on how to setup automatic failover and connection state synchronization. Linux Journal makes the issues available online after two months so if you can't wait that long you can buy it online or at your favorite newsstand. We are happy to share that we are getting ready to officially release Firewall Builder V4.2 in the next couple of weeks. This release includes enhancements for all supported platforms with a particular emphasis on BSD PF and Cisco ASA & PIX firewalls. Import of Cisco ASA and PIX configurations. Now you can quickly and easily add existing Cisco firewalls to your Firewall Builder data file. Support for Cisco ASA v8.3 configuration generation including support for the new nat() command syntax. Bridge interfaces, static routes and rc.conf style configurations for BSD PF firewalls. Enhanced import wizard for all platforms including object de-duplication and automatic platform and version detection. If you have a chance to try Firewall Builder V4.2 please let us know what you think. Thanks for your support! One of our users recently wanted to use Firewall Builder to manage the firewall in dom0 to control traffic to the virtual servers and control access to dom0. After a bit of testing he wrote up a short how-to blog post. It is always fun to see users using Firewall Builder in innovative and creative ways. If you have an unusual Firewall Builder configuration let us know and we would be happy to add it to our documentation or post a link to it. I was recently exchanging emails with a customer who had just purchased a V4.1 Firewall Builder license. He didn't like the behavior where the GUI showed the interface name in the object tree and showed the interface label in the Policy rule. He asked if we could fix this, and so we changed the behavior for our upcoming V4.2 release. Now the GUI shows both the interface name and label in the object tree. This makes it easier to quickly scan the object tree and know what interfaces you want to use in a rule. The moral of the story is, if there is something that you would like to see us add or change in Firewall Builder just let us know. If it's easy you might be surprised how quickly it could appear in a new version. We are making great progress on our next release which will be Firewall Builder V4.2. This release is mainly focused on enhancing our support for Cisco ASA, Cisco PIX and BSD pf platforms. Here's a quick overview of the features that are available in the latest beta release of V4.2. The last big feature we will be adding to V4.2 is support for importing Cisco ASA and PIX configurations. This will make it much easier for Cisco users to get started with Firewall Builder. Let us know what you think and thanks for helping us make Firewall Builder better! I was at the RSA conference (http://bit.ly/exsTwN) yesterday. After I finished up my meetings I wandered around the exhibition hall. There are over 330 companies with booths at the show which got me thinking about just how many products and companies there are in the security space. With all these companies pushing what are sometimes very similar products, it can be hard to understand the differences between them. For instance I was talking with several UTM appliance providers and the list of features each of them were highlighting were almost identical across the board. So what does this mean for Firewall Builder? Well, first of all it reminded me that there are a lot of products competing for our users attention, so it is critical that we do a good job making it clear both what Firewall Builder does as well as what it doesn't do. But, probably more importantly, it reinforced to me how important it is to stay focused on the problem that we are trying to solve. Our mission is to make firewall management easier and more consistent across a wide range of firewall platforms. We want to do this in a way that scales both in terms of the number of firewalls that users can manage and also in terms of the number of users that need to manage those firewalls. I'm really excited about 2011 and the progress we are going to make towards these goals! As always we want to hear from you. Do you think Firewall Builder's core mission is clear? What do you want to see in Firewall Builder in 2011? Are your firewalls ready for IPv6? I have to admit, over the last few years I have become a bit immune to all the declarations that this year was finally going to be the year that the Internet ran out of IPv4 addresses. While I still think this issue is getting sensationalized by the media, http://bit.ly/eLV7ci, the reality is that 2011 will likely mark the first year where enterprises really have to start planning for how they are going to support IPv6. Even though it may be a little while before your enterprise is running a dual stack network with both native IPv4 and native IPv6 it’s probably time to start planning for when that day arrives. One notable change driven by IPv6 will be how network and security administrators think about firewall functions and network boundaries. For example, one of the goals of IPv6 is to have a large enough IP address space that Network Address Translation (NAT) is no longer necessary. However many security administrators view NAT as providing useful hiding of their internal IP address schemes. I predict there will be a lot of interesting discussions about how best to secure IPv6 networks as it gets more widespread and mainstream adoption. So, why am I posting about IPv6 you ask? One of the features of Firewall Builder is that it has built-in support for creating IPv6 objects and using those objects in your rules. This helps reduce the pain of deploying and supporting IPv6 firewalls. As noted IPv6 network architect pointed out to me, using a tool like Firewall Builder where objects are used in rules instead of straight IP addresses becomes even more critical with IPv6. How many times do you have to type 2001:0db8:85a3:::8a2e:0370:7334 before you make a typo?? Right now Firewall Builder supports IPv6 rules generation for Linux ip6tables, BSD pf, Cisco router access lists and ipfw, however I expect that as we see more of our users adopting IPv6 that we will add support for other platforms like Cisco ASA and PIX firewalls in the future. Are you already using IPv6 or starting to plan for it? Let us know in the comments how you see IPv6 affecting your firewall management plans.